Movies teach us how to watch them. More than that, they imprint their devices and techniques on our brains. It’s why a filmmaker can cut from an establishing shot of a house to a medium shot of a kitchen, and we’ll intuit that the latter is within the former—we’ve seen this particular convention so many times that making the mental leap is second nature. But while movies traditionally rely on such innate understanding, it’s also totally possible to break the rules for the purpose of surprise or obfuscation. Silence Of The Lambs contains a sly example of this strategy, crosscutting between an FBI team getting ready to raid a property and serial killer Buffalo Bill scrambling to the front door of his property—only to reveal, when Bill finally answers the door, that the feds are at the wrong house and that Clarice is the one knocking. It’s a great mislead. Arrival, which similarly follows a skilled professional woman operating within a system dominated by men, does something even more sophisticated: It long-cons the audience by using its familiarity with filmic tropes. The movie opens with what appears to be a conventional prologue, depicting Amy Adams’ Louise raising, comforting, and eventually saying a tearful goodbye to her daughter, who dies in a hospital. Throughout the rest of the film, director Denis Villeneuve keeps splicing in elliptical cutaways to the character’s time with her kid—moments that play like fluttering flashbacks, the kind Alain Resnais helped standardize with Hiroshima Mon Amour. We’re seeing backstory, meted out through slivers of near-subliminal memory. Except that we aren’t. The big reveal in Arrival is that the aliens have come all this way to Earth to gift us their language, a system of written communication that actually hardwires the brains of everyone who learns it, allowing the lingual to perceive time as circular instead of linear—to effectively see the past, present, and future at once. As it suddenly becomes clear, the flashbacks to Louise’s traumatic past are actually flash-forwards to her future, when she’ll have a child with her new colleague, Ian (Jeremy Renner). Villeneuve uses this big rug-pull to make a pretty profound point about the way we choose to live our lives—one not so different than the notion that Eternal Sunshine Of The Spotless Mind ultimately lands on. Arrival makes the point, straight from the story it’s based on, that language actually controls how we think, shaping our understanding of reality. It’s enormously smart for the movie to underline that theory by showing how the language of movies shapes how we perceive their reality. 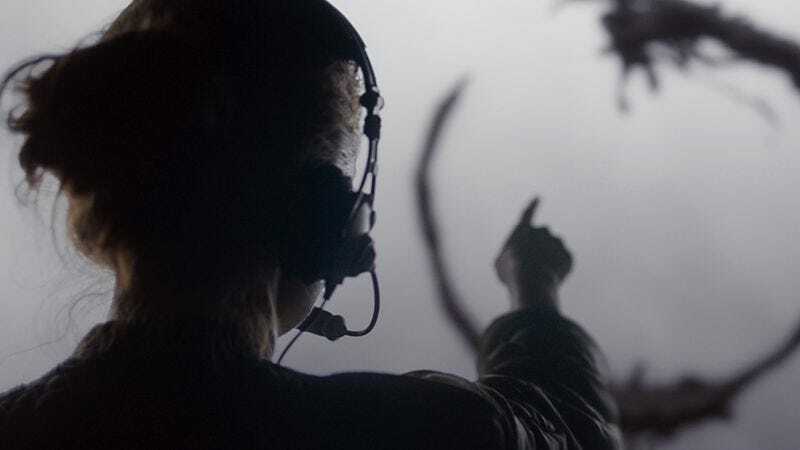 That Villeneuve actually broaches the topic during a nightmare sequence, punctuated by a scare lifted wholesale from his earlier Enemy, is another clever act of misdirection—a way to get us to miss what’s right in front of us. The movie isn’t perfect, but as a shell game at the audience’s expense, it’s pretty out of this world.